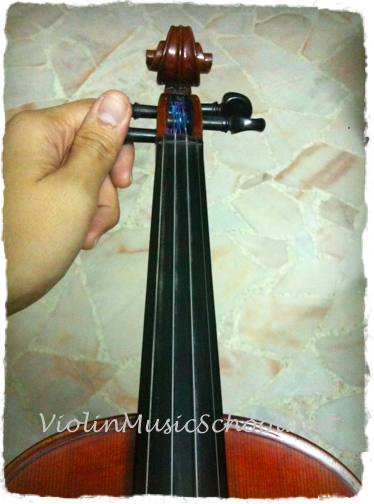 How To Change Violin Strings? 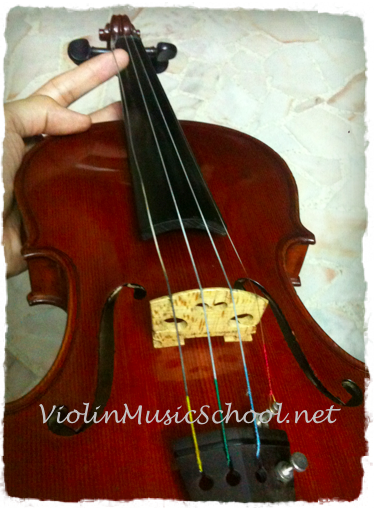 I hear a sigh of relief – finally a guide to show me how to change violin strings! We know violin strings are important components of the violin, and we know that the quality of the strings does determine the sound produced by the violin. However, what worry most violinists, usually the beginner and intermediate players, is how to change violin strings when the violin needed one. But their worries stop here. While you can have a professional to change strings for you, this guide will show you how to change violin strings safely, and hassle-free. Of course, get your violin strings first! If your violin strings are broken, and you’re unsure what are the strings to buy, check out this guide to learn how to choose violin strings. Yes! You’ve made the choice about the type of strings you’ll get, and the brand too. But If you’ve not bought the strings, you can check out our Violin Music Shop for the latest deals of violin strings! – In 6 Simple Steps! All ready? 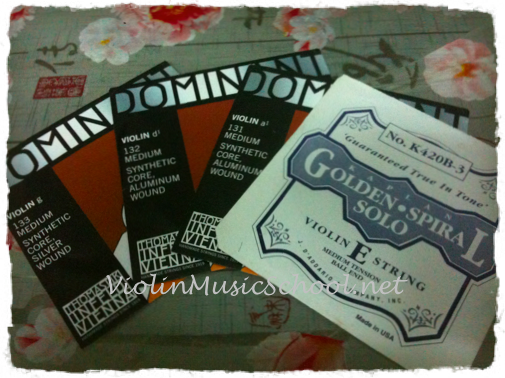 let’s change your violin strings now! Here is the step-by-step guide to help you, change all your strings. 1. Get all your strings ready. Separate them out with G, D, A, E. Have your violin by your side too. 2. When we change violin strings, most will start from the G first, also the lowest strings of all. Unwound the peg at the top for G string only, and remove them slowly. Note: Remove the G string only, and leave other strings intact. Do not remove all at once. 3. With your new G string in hand, insert the top end of the string into the peg. At the bottom, insert the ball end of the new G string into the tailpiece. Both sides of the new G string is being secured in the violin but not tightened. 4. With right hand on the loose G string, and left hand on the peg, turn the peg ‘away from you’ to tighten the string. Turn the peg slowly, and lower your right hand with the G string, onto the fingerboard, until the whole G string rested on the violin bridge. 5. Now, the string is slightly secured and tightened, but is flabby and not tuned to the right note. You could now take our your violin tuner, or simply tune the violin yourself to bring the G string to the right note. 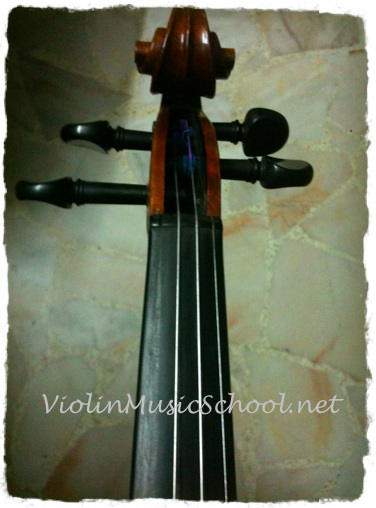 Click here to learn how to tune your violin. 6. Once G string is changed, you can move on to change the next string, D, by repeating step 2 again. Repeat the steps until all strings are changed. After you have changed your strings, do note that you might require regular tuning in the next 48 hours, depending on the type of violin strings you use. Don’t throw away your old violin strings– if they are not broken. Most old violin strings still can be used and played, just that they are of lower quality now. Keep them in case of emergency. Or you can buy an additional set of violin strings for spare. 1. While you’re turning the pegs to tighten the strings, look at the strings wounding around the peg. Make sure they are wounded properly and tidily. This will help you secure the strings, and make tuning easier later on. 2. Do not turn the pegs too fast while you’re fastening and tightening the strings. This is especially important for new violin strings. New strings have not been stretched, hence, turning too fast might risk breaking them. 4. If you face any difficulties when you change violin strings, such as securing the strings, turning the pegs…etc, and you still couldn’t overcome it, get a professional to help you. 5. You do not have to wait till your strings break or unwound itself before you change violin strings. The more you play, the faster your strings will wear off. Hence, concert violinists do change their strings frequently, some as much as bi-weekly or monthly. However, do not let this stops you from playing the violin everyday. Do Change violin strings frequently to prevent them from breaking in crucial times – live performances. More questions on how to change violin strings? Leave them below!